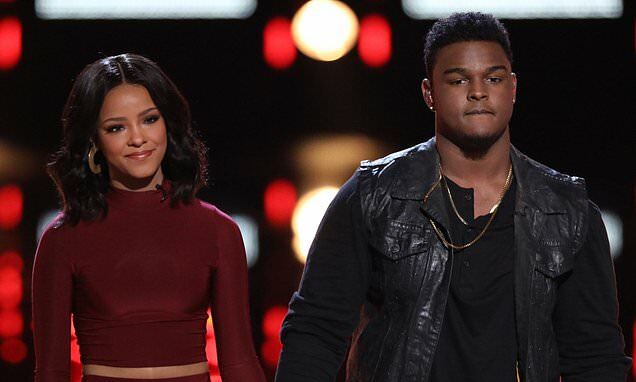 DeAndre Nico was saved by viewer voting on The Voice on Tuesday after a sing-off against Lynnea Moorer. The 22-year-old singer from Port Arthur, Texas after winning the Instant Save became the last contestant to join the top 10. The top 11 after performing live on Monday gathered again on Tuesday to learn who was moving onto the next round of the NBC singing competition show. The first singer to advance into the top 10 was Jennifer Hudson's teen sensation Kennedy Holmes, 13, who is the youngest remaining contestant in the competition. The next to move forward was Kymberli Joye, 26, who earned a standing ovation from all four judges on Monday after her performance of the gospel song Break Every Chain. Country star Blake Shelton, 42, took the stage with his singers Chris Kroeze, Dave Fenley and Kirk Jay as they belted out the 1983 Alabama hit Dixieland Delight. Adam Levine, 39, celebrated next as his singer Reagan Strange, 14, advanced to the Top 10 after being the most streamed from The Voice on Apple Music for the second week in a row. Wisconsin singer Chris, 27, of Blake's team was next to advance. Country pop star Kelsea Ballerini, 25, who served as a 'fifth judge' this season for The Comeback Stage also performed during the live one-hour show broadcast from Los Angeles. She wore an all-black ensemble while performing her new song Miss Me More.